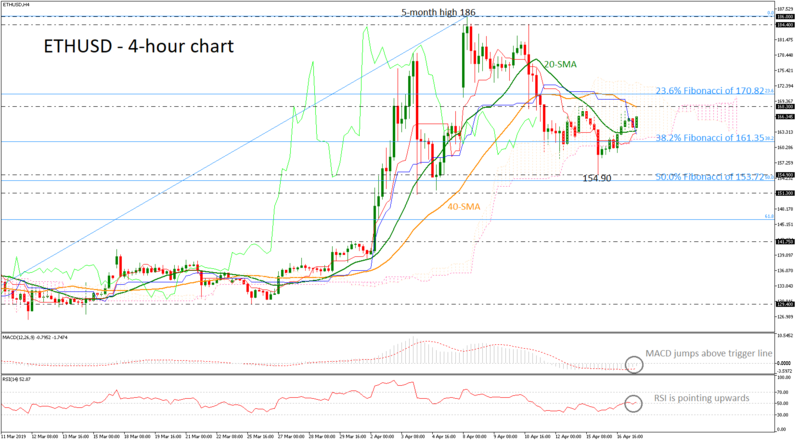 ETHUSD has been trading inside the Ichimoku cloud and between the 20- and 40-simple moving averages (SMAs) in the 4-hour chart. Over the last week the price has been moving sideways after the drop beneath the 168.30 barrier. The MACD oscillator is heading upwards, above the trigger line and the RSI entered the positive zone, pointing upwards. Resistance could occur around the 168.30 hurdle, which coincides with the 40-SMA. A break above this area could increase the bullish sentiment, retesting the 23.6% Fibonacci retracement level of the upleg from 121.25 to 186, around 170.82. On the downside, the Ethereum may meet immediate support at the lower surface of the Ichimoku cloud around the 38.2% Fibonacci of 161.35. If the market manages to drop below these levels, the price could fall towards the 154.90 obstacle and the 50.0% Fibonacci of 153.72. To sum up, the very short-term bias remains bearish after the pullback on the five-month high of 186, despite the signals of the technical indicators.